It has been to long between posting and way to long sharing. I have been working on a number of projects mostly wedding invitations, getting my studio ready for the new flooring and finally painting my studio. Yes, pictures will follow. I must say packing up my studio has been a challenge, I mean oh my god I have so much stuff. I can't possible share how much, it is sick. I even had to buy big large bins to store everything, I bought 7 yes 7, 36 gallon containers which I have filled to the rim. This doesn't count the other endless Rubbermaid containers I already had. But I am getting there, little at a time. The guys are coming tomorrow to dig a hole in my cement basement so that the floor will be level and there won't be any buckling later. So what I thought was a small job is really a big one, but soon the red floor with half tiles (the people who owned the house previous only tiled where the carpet ended) will be gone. I am going to ensure that I take a before and after pic for the record of course. 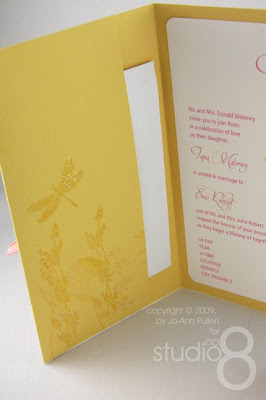 This week I received 2 special deliveries one from Two Peas and the other Papertreyink. I pretty well limit myself to these 2 places plus my Stampin Up stuff. From Two Peas I bought or should I say at the time cleared out 4 of their Wisteria Collection Paper series I am not kidding I bought 20 sheets of each style, going to make wedding invitation with them. For who? who cares I just love the paper. I also bought the matching stamp set which I will be using as part of the design. Here are the links to what I bought in case your interested. 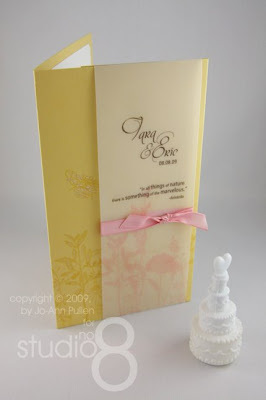 From Papertrey Ink I order the following sets that I plan to do wedding invitations with. A few sets were back ordered their stuff is so popular. Of course some paper and some matching ink that I will be using to make another wedding invitation, this one is for a good friend of mine that is getting married next summer. Here are the links to what I bought in case your interested. Here is the wedding invitation that I have designed for a good friend who is getting married this summer, her theme is a garden wedding. She loves the colours pink and yellow and using the stamp set Life from Papertrey Ink plus Patterned Bugs from Inkadinkado I created this garden delight. 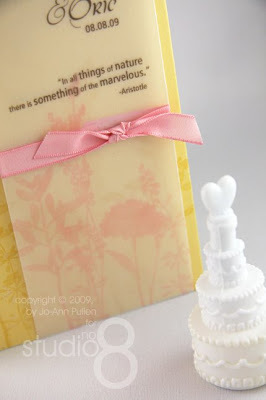 Everything else was using Stampin Up Product and the text was generated on computer, using RGB colours. Let me know what you think. 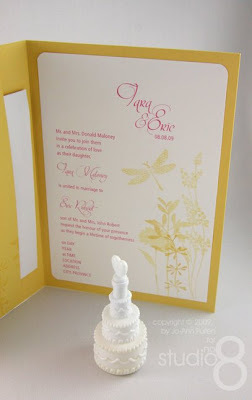 These wedding invitations are beautiful! Awesome job!